I was in Lowe's to pickup some plumbing things when I walked by this. I've needed a circular saw since my Black and Decker corded bit the dust. My BIL has a Milwaukee cordless that I've been using when ever I help him out around the farm. This feels nice and sturdy for the price. I don't expect it to last as long as his Milwaukee given the price difference, however I don't feel much quality loss. It's nice and light and cuts with ease. Only thing is it comes with only one battery which is off puttin as most come with two. However there are many tools for the battery system. As a weekend warrior I think it's a pretty darn good saw! Nice -- now they got you locked into the battery system. Sell the tools cheap and make the profit on the batteries -- just kidding Tim, you have a pretty good little saw there. Hope it works out for you. 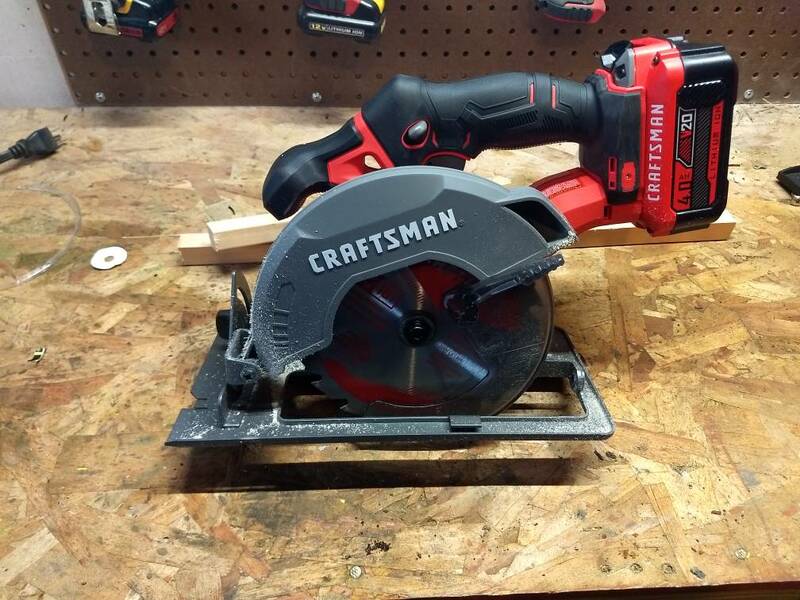 You will love that cordless saw. I bought an 18V Ryobi discount at HD when I worked there years ago. That cordless is the first saw I reach for when I have a need. i am not up on current cman stuff but my opinion is this. if it is the new sbd made line i give it a thumbs up. i think it carries a lot of dewalt family genes. if it is the new sears made lineup.........find some way to return it and get something different. anything else. The battery did look familiar to my 20v DeWalt battery. I believe that Ryobi makes the CM, electrics. Serviced some hardware in SC, for them. I remembered hearing that while onsite and stuck. That's now 10 or so years back, and might have change of course.